Blackwell was born in Luton on 21st December 1958. After being rejected by Ron Atkinson at Cambridge after Youth level. He started his career with Bedford Town, as a goalkeeper and then joined Barton Rovers, playing for them in the FA Vase Final at Wembley in 1977-78, and Middlesex Wanderers with whom he toured Holland and Indonesia. A bricklayer by trade, he joined Barnet for the 1978-79 season, but after twenty-five games he joined Boston United for �000 at the start of the 1980-81 season. He went on to play Two hundred and twenty-five League games for the Pilgrims as well as twenty in the FA Cup and nineteen in the FA Vase Trophy, eleven in the League Cup and fourteen in other games. He played for Boston in the 1983-84 FA Trophy Final at Wembley, where he saved a penalty. He moved back to Barnet at the end of the 1985-86 season but could not break into their team as Steve Humphries was the incumbent and, after just five games, he was signed by Neil Warnock in November 1985 for Scarborough, who were then in the Conference League. It was to be the start of a long on and off association with Warnock. By the time he arrived at Scarborough had seen his better years and had still not played in the Football League. This was remedied as Scarborough were promoted to the football League Fourth Division at the end of his first season in which he had made twenty-five appearances. He added another forty-four appearances to his Boro tally in the three seasons he played for them in the Football League, before moving to Notts County on 8th November 1989 for �,000. Warnock had left Scarborough for Notts County in January 1989 and wanted his old shotstopper as goalkeeping cover at Meadow Lane. He was at County when they reached the First Division via the play-offs but never played a League game there before he again joined up with Warnock at Torquay United on 15th January 1993 as they battled to stay in the Third Division. At Plainmoor he made eighteen appearances before again following Warnock, this time to Second Division Huddersfied Town on 5th August 1993, after Warnock had moved on after keeping Torquay up at the end of the 1992-93 season. He made one substitute appearance in his first season there and three startsand another game from the bench as Town were promoted via the play-offs in the following season. At Huddersfield Warnock gave Blackwell his first chance at Coaching and after Warnock again sought pastures new, this time with Third Division Plymouth Argyle, it was no surprise that Blackwell would follow him to take up the position of Player-Youth Coach on afree transfer on 11th August 1995. Plymouth gained promotion in his first season there and Blackwell played his part with twenty appearances and followed this up with another four games in the Second Division in what was his last season in the Football League as a player. Warnock was off again in February 1997, but this time Blackwell remained behind as Assistant Manager to Mick Jones. When Jones was sacked in June 1998 Blackwell soon left and by now Warnock had moved to Bury and it followed that Blackwell was appointed as Goalkeeping Coach and later became the Assistant Manager at Gigg Lane. In December 1999 Warnock was appointed Manager at Bramall Lane and so Blackwell became Assistant Manager of Sheffield United. The pair made an awful start to their first season in charge at Bramall Lane, but were able to fight off relegation and secured the club's status with a mid-table finish. The next few seasons saw the club building from within, and the Blades became regular challengers in and around the play-offs. 2003 proved to be a successful season for Warnock, as he led the team to the semi-finals of the FA Cup and League Cup, applying the knock-out to Terry Venables' team in both competitions, as well as the final of the First Division play-off, only to be beaten by Wolves. 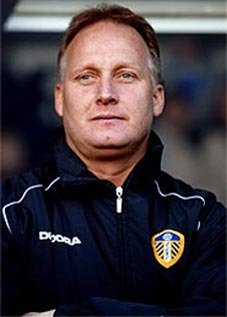 When Peter Reid was appointed Manager of Leeds at the beginning of the 2003-04 season, he appointed Blackwell as his Coach and Assistant Manager. After Reid was sacked he carried on as Eddie Gray's Assistant until the club was relegated at the end of the season and to most people's surprise he was appointed Manager on 1st June 2004. He was seen as a cheap alternative and asked to operate on a shoe-string budget as there was an almost total clear-out of all the club's star players which they could no longer afford in the CCCL. Older lesser-paid players were the order of the day and while some were value for money others were a total waste of money. Once more the club found itself in financial chaos which led to a takeover by former Chelsea owner Ken Bates. There were rumours of Bates installing Dennis Wise as Manager but it did not eventuate at that point of time. After a mediocre start to life in the CCCL Leeds limped home in a healthy mid-table position of fourteenth which did not please the fans but was acceptable in view of the turmoil andrecord number of signings by the club. Neil Sullivan was ever-present with forty-six appearances, followed by Gary Kelly forty-three, Paul Butler thirty-nine, and Sean Gregan, Danny Pugh, Jermaine Wright, Clarke Carlisle, Frazer Richardson, David Healy, Matthew Kilgallon, Brian Deane and Simon Walton were also regulars and Rob Hulse had been signed before season's end. In the off-season Blackwell was given financial backing and proven strikers Richard Cresswell and Robbie Blake were signed to join David Healy and Rob Hulse in ensuring Blackwell had plenty of firepower in the attack, while he picked up out-of-contract USA International winger Eddie Lewis from Preston North End on a free transfer to supply the ammunition. It was felt that Blackwell had bought well and addressed United's weaknessses. United were up with the front-runners most of the season always within striking distance of the promotion spots. With a play-off position virtually assured Blackwell was rewarded with a new improved three year contract on 7th March 2006, it was thesignal for a sharp decline in United's fortunes, but they were able to finish fifth in the table and won 2-0 at Preston after North End thought they had it won with a 1-1 draw at Elland Road in the Play-off Semi-Finals but alas United and Blackwell were outplayed and out-thought in the Final by Watford and Blackwell's former Assistant Aidy Boothroyd as they lost 0-3 at Cardiff's Millenium Stadium. United made a terrible start to the 2006-07 season and had only amassed seven points from eight games and with them in twenty-third position Blackwell was sacked by the club on 20th September 2006. He was replaced by Dennis Wise and his Assistant Gus Poyet and United had to compensate Swindon Town for their services. Blackwell returned to League Football Management with his home-town club, Luton Town on 27th March 2007. Luton were deep in financial trouble and he must have had a feeling of deja-vu as he had to sell all the club's better players and buy a cheaper variety. The club went into administration on 22nd November 2007. Blackwell handed in his resignation on 12th January 2008, effective 9th February 2008 but was duly sacked by the administrators on 16th January 2008. Luton were relegated at the end of the season. On 14th February 2008 Blackwell was appointed Manager of Sheffield United, taking over from Bryan Robson, who had managed to win just one game in ten in the CCCL. He initially had a contract to the end of the season. The Blades finished ninth in the CCCL just four points outside the Play-off positions.He had been confirmed as the permanent Manager of the Blades after he had piloted them to just two League defeats in thirteen matches on 3rd May 2008. Sam Ellis was also confirmed as his Assistant Manager and the Blades went on to reach the play-off final, having finished third, just three points away from automatic promotion to the EPL in the 2008-09 season. Unfortunately, after beating Preston North End 2-1 on aggregate in the Semi-Finals, they lost the Final 1-0 to Burnley. 2009-10 saw Sheffield United finish a disappointing eighth and on 14th August 2010, after a 0-3 loss to Queens Park Rangers at Bramall Lane, Blackwell left the club by mutual consent. In March 2011 Blackwell was approched by Coventry City and in May 2012 he was touted as the replacement for Nick Barmby at Hull City. He was reunited after eleven years with Neil Warnock at Crystal Palace in August 2014 when he was appointed Technical Director. He remained there after Warnock, when Alan Pardew took his place until leaving in February 2015 when he went back to a coaching position with Barnet to assist Martin Allen in the club's push for promotion from the Conference Premier League until the end of that season. He was reunited once again with Warnock, as Assistant Manager, and Ronnie Jepson initially at Queens Park Rangers from 12th November 2015 to 4th December 2015 and then at Rotherham United in February 2016. After they had guided that club to safety in the Championship League, in May 2016, the management team left the club. They then soon joined Cardiff City on 5th October 2016 and still remained there in September 2016 after they had guided the club into the EPL at the end of the 2017-18 season and were contracted until 30th June 2020.